Does the United States have the greatest military in the world? The fact that we spend over $600 billion on defense annually — more than the defense budgets of China, Russia, Saudi Arabia, India, France, United Kingdom, and Japan combined — would seem to suggest that we do, but Americans will have to wait at least another year to see the proof with their own eyes. 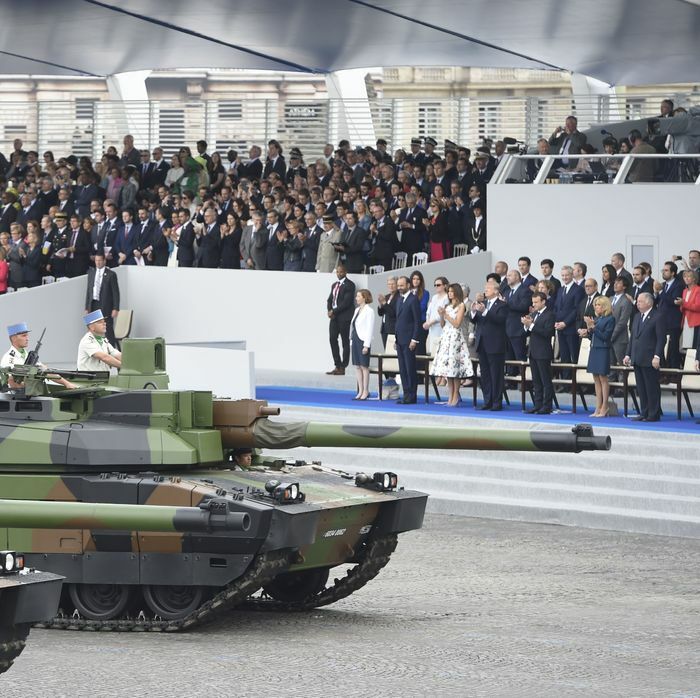 On Thursday night, the Pentagon announced that the military parade President Trump ordered has been postponed from days after the midterm elections to some indefinite point in 2019. This announcement came hours after CNBC reported that the event could cost $92 million, up from the original estimate of $12 million. An anonymous U.S. defense official said $50 million would come from the Pentagon and $42 million would come from interagency partners like the Department of Homeland Security. But Trump’s ambitious plans kept getting scaled back. He initially suggested a Fourth of July parade, but in March a memo from the Office of the Secretary of Defense suggested it would be integrated with the existing D.C. Veterans Day parade. The event would focus “on the contributions of our Veterans throughout the history of the U.S. Military, starting from the Revolutionary War and the War of 1812 to today, with an emphasis on the price of freedom” — not just awesome military gear. In fact, there would be no tanks, only wheeled vehicles, due to concerns over damaging the streets (and possibly, because the Pentagon wanted to scale back the authoritarian theme). The parade was widely criticized as a waste of money, even when it was estimated to cost $12 million. Earlier this year, Trump bragged about saving costs by suspending joint military exercises with South Korea, which cost just $14 million. After the new estimate came out on Thursday, the American Legion responded by saying, basically, thanks but no thanks. You win this round, Macron.